A good mix of features, plus a high quality build make this tempting for digital DJs on the move. Lightweight and compact, with carry case included. Solid controls. Built-in audio interface. Sound quality of interface is average. Allen & Heath is something of a British institution, with a history of making quality audio equipment that stretches back to the seventies. Perhaps best known for its studio mixers, it's re-invented itself in the DJ world. The Xone:K2 is its latest product, aimed at the travelling DJ or anyone who needs a slimline but well specified MIDI controller with a built-in audio interface. The K2 measures just 135 x 30 x 358mm and weighs 1kg. So, it's definitely a small package but is that always a good thing? "Designed with portability in mind, it comes with a padded carry case that doubles as a stand to raise it up to the height of a DJ mixer"
The K2 is a compact and lightweight unit that fits easily in a bag or DJ booth. Designed with portability in mind, it comes with a padded carry case that doubles as a stand to raise it up to the height of a DJ mixer. The chassis is made of rubber-coated plastic with a metal top panel, which is solid without being heavy. The layout feels comfortable and the potentiometers and encoders are securely bolted down, so they should stand up to the rigours of live use. The rubber knobs are a nice shape, and the tri-colour illuminated rubber switches have a firm but reassuring click. Finally, the four 60mm faders work smoothly but, while they have the renowned Allen & Heath smoothness - with tops indented generously, making them a pleasure to use - the studio-styling makes them perhaps less than ideal for DJ use. The audio interface has four outputs: two RCA at the back and a stereo 3.5mm headphone socket at the front. The manual suggests several uses, including connecting the outputs to a mixer for DJing, or one output pair for headphones and the other for speakers. Sound quality is adequate with a sample rate of 44.1 or 48 kHz, but the 16-bit converters mean that it's not going to compete with more expensive units. It's a shame that you can only control the output volume using software, and it would also be nice if the headphone outputs were duplicated on RCAs at the back, but you can't have everything at this price. As the controls are unlabelled, you are free to use them as you wish. Allen & Heath supply some mapping files for Ableton Live and NI Traktor, which are a good starting point. Where things get interesting is with Latching Layers. This feature allows up to three layers of controls and it is possible to switch some of the controls while 'latching' the others. For example, the knobs could be 'latched' to control EQ, while the buttons switch through three layers of effects parameters. 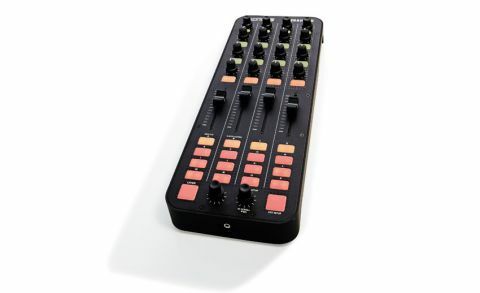 "It is an extremely flexible device with a clever layering system and a vast array of controls"
A pair of Allen & Heath X:Link ports, which allow you to connect multiple Xone controllers together, can be found on the rear. Chained K2s receive power and data over the proprietary connection and complex setups can be created using Allen & Heath mixers. The whole thing can then be connected to the computer with just one USB cable. Obvious competitors for the K2 are the Native Instruments F1 and X1. These are smaller in size and offer fewer features, but Traktor DJs may still prefer them as the controls are specifically tailored to their needs. The K2 works very well for the more adventurous user as it is an extremely flexible device with a clever layering system and a vast array of controls. With all that plus the carry case and mappings in the box, it's ideal for those who use a variety of software or who like to customise their mappings. The built-in audio makes it attractive as a portable DJ setup and it would also be great as an extra set of knobs in the studio. A serious contender.